'The Diet Myth is fascinating, and now I'm obsessed with microbes!' Nigella Lawson Why do most diets fail? Why does one person eat a certain meal and gain weight, while another eating the same meal loses pounds? Why, despite all the advice about what to eat, are we all still getting fatter? The answers are much more surprising - and fascinating - than we've been led to believe. The key to health and weight loss lies not in the latest fad diet, nor even in the simple mantra of 'eat less, exercise more', but in the microbes already inside us. 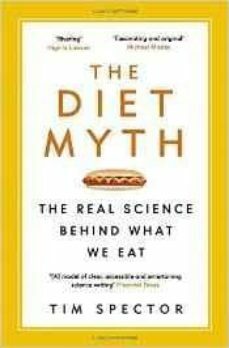 Drawing on the latest science and his own pioneering research, Professor Tim Spector demystifies the common misconceptions about fat, calories, vitamins and nutrients. Only by understanding what makes our own personal microbes tick can we overcome the confusion of modern nutrition, and achieve a healthy gut and a healthy body.